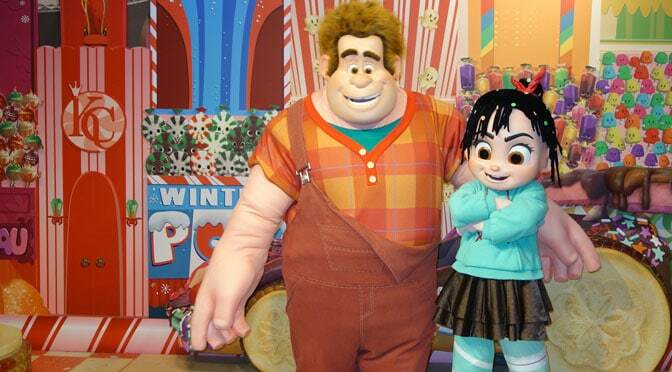 Fans have clamored to see Ralph and Vanellope return to Disney Parks for regular meets. You got your wish! Ralph and Vanellope are coming to Epcot and California Adventure soon! Disney – “Disney’s all-new animated adventure “Ralph Breaks the Internet” is coming to theaters November 21. To celebrate, Ralph and best friend Vanellope von Schweetz are once again venturing beyond Litwak’s arcade for special appearances in Disney Parks. Are you excited to meet Ralph and Vanellope again? I’m adding the info to Character Locator right now so you can add it to your touring plan! Previous PostSave 30-40% with Florida Resident Fall TicketsNext PostThe 2018 Pop Century Christmas Refillable Mugs have arrived! I’m a little bit confused by where they will be in Epcot. Is it near the figment ride? Or near where bayman/joy/sadness are? Thank you for the clarification! Awesome! My daughter is so excited for the new movie. Hope they last until April 2019. Though I’m anxious to hear if they are replacing any of the current characters. Are they taking the place of Baymax or Joy & Sadness? Thank the maker! This is wonderful news Kenny!! Will they be signing autographs or no? So excited! We are going to be there at the end of November. My daughter has already been planning to make Vanellope ears. She’ll be ecstatic to meet her! Do you think this will have any impact on current meetings with Baymax? My kids were looking forward to meeting Baymax and we’ll be in Epcot in early December. I think Baymax is at HS too. Will this be temporary or you think I will have a chance at seeing them Dec 2019 lol ?? ?